“Long live the Leader!” and “War is to man, as motherhood is to woman”. University of North Carolina Press, 1985, pp. 128-29. On 11 February 1929 years of delicate negotiations ended with the signing of the Lateran Accords: a treaty, a financial convention, and a concordat. The Italian state recognised the state of Vatican City under the sovereignty of the pope, and the Holy See recognised the kingdom of Italy. Some of the terms of the Concordat, however, caused serious problems. In effect the document repudiated the laic tradition of the Risorgimento by giving the Church wide powers in important spheres of Italian life, including education. Article 35 emphasised the juridical parity of Catholic schools by guaranteeing the right of students in those schools to take the esame di Stato [final exams at the end of secondary education] under the same conditions as students in state schools. 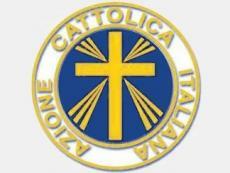 [Article 36] stated: “Italy considers the teaching of Christian doctrine, according to the form handed down by Catholic tradition, as the foundation and capstone of public education.” Religion, already taught in the elementary schools, was also to be taught at the secondary level by priests using Church-approved textbooks. Pius’ determination to protect Catholic Action bore fruit in Article 43, which recognised Catholic Action but emphasised its apolitical nature. The same article also prohibited ecclesiastics from participating in the activities of any political party. 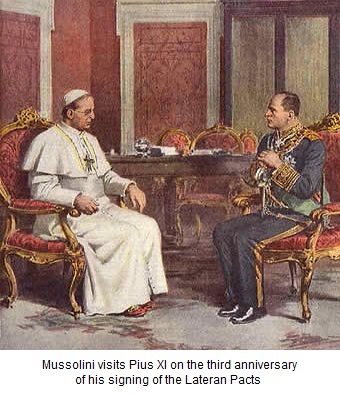 Mussolini was not pleased with Article 43, the most debated in the Concordat and the one that had caused the greatest difficulties during the long negotiations. Significantly, the wording of the article had not changed in drafts of the agreement over the years — testimony to the Pope's steadfastness on the question. Mussolini agreed to sign the article because it was the sine qua non of the entire settlement. In return for the guarantee of Catholic Action, the Pope once again repudiated the Catholic party and had, at least officially, severely circumscribed the permissible activities of Catholic Action groups. The seeds for future conflict were sown. In an audience with professors and students from the Catholic University in Milan shortly after the signing of the accords, Pius praised both Mussolini and the settlement in words widely quoted in Italy and abroad: “The times called for a man such as he whom Providence has ordained that We should meet.... It is with profound satisfaction that We express the belief that We have given God to Italy and Italy to God.” Mussolini received a kind of moral recognition that the Pope's predecessors had always denied to liberal governments. On 13 March 1929 the central committee of Catholic Action passed a resolution calling for a yes vote in the coming elections. For the PNF [Italy's National Fascist Party] the accords seemed to have borne fruit. The conciliation came as a surprise to Italians, though the general reaction was favourable and the settlement undoubtedly redounded to the credit of the regime. The newly elected Chamber ratified the agreement by an overwhelming vote. Only six senators voted against the accords. The only voice of open dissent in the Senate was that of Benedetto Croce. Some Catholics, however, were not resigned; some were offended by the eulogy of a dictator they still regarded as a violent and irreligious ruffian. However, for most Catholics — and certainly for the Vatican — the accords were a kind of insurance, a legal recognition of the political and social influence of the Church in Italian life. The painting by Achille Beltrame shows Pius XI with Benito Mussolini at an audience on 11 February 1932.